​"GUARDIANS OF THE GALAXY VOL. 2"
THE STORY - The team struggles to keep its newfound family together as it tires to unravel the mystery of Peter Quill's true parentage in the outer reaches of the galaxy. THE GOOD - Gunn's focus on character and plot prevails and makes this sequel better than the first film. THE BAD - The film's villain has god-like powers that are not well explained. ​I'll admit that when "Guardians of The Galaxy" first came out in 2014 I was not the biggest fan. I have only ever watched it that one time in the theater and did not find it to be the special film that so many others felt it was. I enjoyed it quite a bit but I felt it was brought down by its reliance on its nostalgic soundtrack to draw up interest from the audience. However, "Guardians Of The Galaxy Vol. 2" does exactly what a sequel should do: it gives us a bit more of everything. All the characters get equal attention and a moment to shine. The action is bigger, the story is more personal and the focus is more concentrated on the character's relationships with one another, making for an unorthodox group of heroes that can be called a family. Now dealing with their new titles as the Guardians Of The Galaxy, the odd pairing of Peter "Starlord" Quill (Chris Pratt), Gamora (Zoe Saldana), Drax (Dave Bautista), Rocket (Bradley Cooper) and Baby Groot (Vin Diesel) are back for more adventures as they race across the galaxy to avoid capture from Ayesha (Elizabeth Debicki), the golden High Priestess and the leader of the Sovereign people. They are aided by Ego (Kurt Russell), an ancient god-like being who reveals himself to be the true father of Peter Quill. They are brought to his home planet where they also meet his pet empath (Individual who can read and change people's emotions) Mantis (Pom Klementieff), who warns the Guardians that Ego is not all that he appears to be and has more sinister plans in store for Peter and for the entire galaxy. Writer/Director James Gunn really shines here as both a screenwriter and director. Right from the very beginning, "Guardians Of The Galaxy Vol. 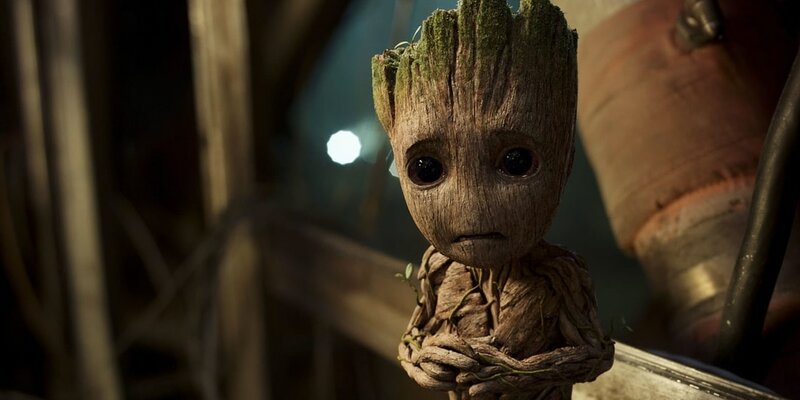 2" comes swinging right out of the gate with one of the best opening credits sequences of the year which features Baby Groot (Who is the cutest thing you will see in a movie this year) very prominently, set to "Mr. Blue Sky" by Electric Light Orchestra. This sequel emits such a playful and good natured heart at its center with one focus: to entertain. Marvel has done a very good job of accomplishing this over the past decade. However, there's something about the goofiness and sheer large amounts of fun that "Guardians of The Galaxy" gives off to its audience. This is evident in every line of dialogue, every scene, and every new piece of character development. Gunn hit a home run with his cast in the first film and here, the actors are each given a chance to shine both through their actions and their empathy for one another. These are all damaged individuals with complicated backstories from Drax's dead family, to Gamora's relationship with her sister Nebula (Karen Gillan), to Rocket's insistence to be the biggest pain the neck imagineable, to Peter's parental issues with both his real father Ego and his surrogate father Yondu (Michael Rooker). None of this should all work in one movie that is under two and a half hours but it does because Gunn puts the focus of the film on his characters as opposed to the action set pieces and the result is one of the most enjoyable Marvel films I have seen in quite some time. On a visual level, "Guardians Of The Galaxy Vol. 2" mixes the best of "Star Wars," "The Fifth Element" and "Star Trek" together, much like the first film, to terrific results. While not as visually inventive as something like "Doctor Strange," James Gunn's sequel is filled with intricate costumes, colors that pop and set design that rivals anything else that the Marvel Cinematic Universe has ever put out. The soundtrack is also a rocking good time with classic throwback tunes sprinkled throughout. It feels much less like a gimmick this time around to get audiences hooked into the movie and now after two movies, helps to give this series a unique identity separate from the other Marvel films. James Gunn's effort here feels so much more confident this time around and I appreciate nearly every aspect of this film with one exception. Once again, as seen in many other recent superhero films ("X-Men: Apocalypse" & "Suicide Squad") the villain of this film is presented as being god-like and we, as the audience never understand the full limitations of his power. Luckily, the film is less focused on these details and instead focuses on the character's banter with one another during these scenes and how well they work together as a team that this can be easily forgiven. James Gunn gives "Guardians Of The Galaxy Vol. 2" more humor, more drama and more moments of character than I can recall from an ensemble superhero film in quite some time (Possibly since the first "Avengers" film). Whether it be situational comedy, physical comedy or the downright bizarre (David Hasselhoff? Howard The Duck? Pac-Man?!) James Gunn once again makes his Marvel film work despite all of the ridiculousness that surrounds it. This is because he focuses on character and plot over the set pieces that have a tendency to overwhelm these types of films, making for one of the best Marvel films to date. While I was not anxisouly awaiting Vol. 2, I now cannot wait for Vol. 3.